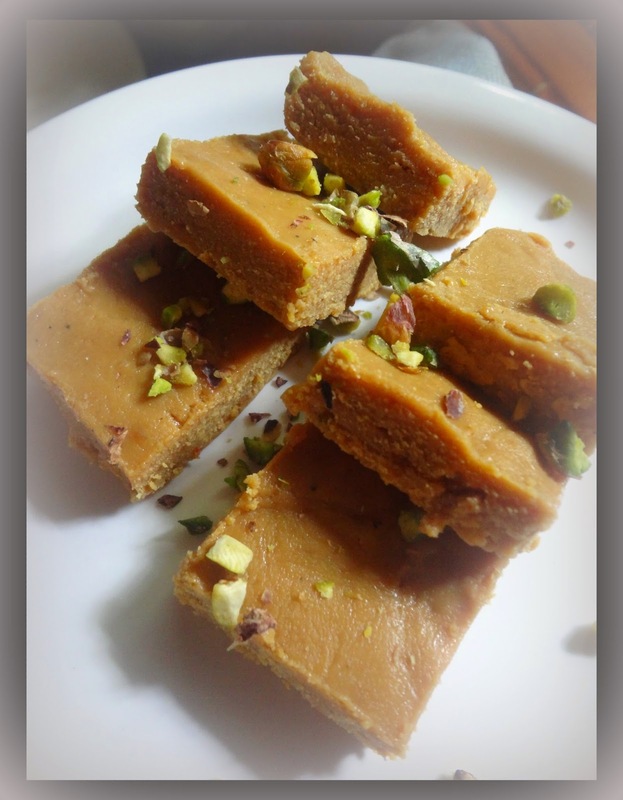 On this happy Mothers Day I dedicate this simple but utterly delicious caramel fudge to my loving mom who has churned out many delicious dishes from her humble kitchen and now enjoying her retirement in contentment. I remember that she always had a way of making a miracle in the kitchen with so few ingredients and bringing a yummy treat for us kids for every significant occasion such as our school results, no matter what the outcome was always, consoling us with a there is always a next time as only a loving mom can. How I wish I can recollect each and everything she made , but one delicious treat is for ever etched in my memory as it was made quite frequently seeing how easy it was, and how quick too, with no microwave or fancy ovens.The no of ingredients were simple and few. I have just added a teeny tweak like the garnishing etc otherwise the recipe remains my moms ! She never called it a caramel fudge, but a simple chocolate milk sweet as it tasted like one of those caramel chocolates which we distributed to our friends on our Birthdays. Hence I named it as a caramel fudge . Slivers of almond or pistachio for garnish. 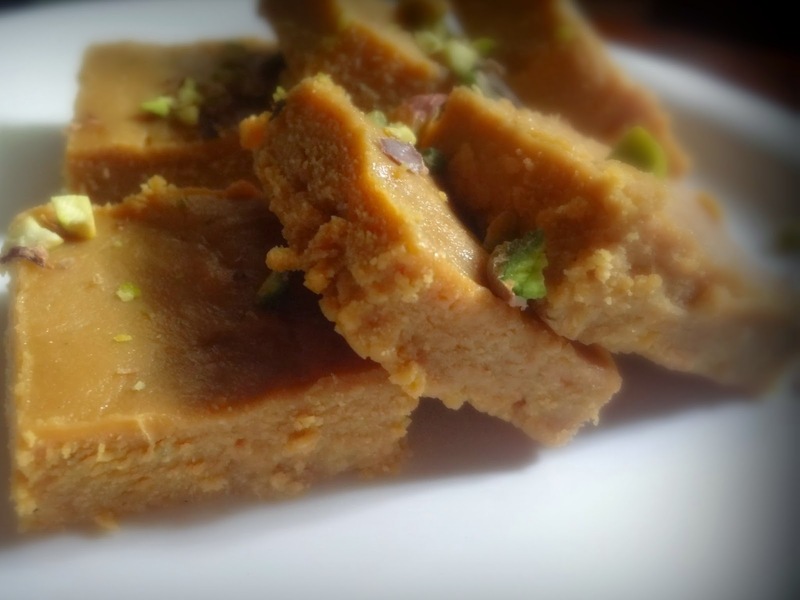 Take a hard based saucepan to make the caramel .Add sugar and keep on low heat, soon it will start melting, add the butter or ghee and allow it to melt completely. While it is getting melted., take another pan ,add the milk powder to it. Do not keep on stove yet. Add hot milk and the melted ghee and quickly mix to form a smooth dough like texture, if you find the mixture too wet or loose, add more milk powder and keep on a low flame . Now the caramel is melted and runny in texture, quickly add the caramel sauce and stir well to make it lump free.You will notice after adding the caramel sauce the mixture quickly changes colour and becomes light brown , tea colored and a chocolaty aroma will hit you. As soon as the whole mixture comes to a smooth ball , remove from flame and let it cool a bit. you can also test the texture by dropping a small ball in water and if it remains soft, remove from flame. Take a greased tray and spread this mixture, sprinkle slivers of nuts if you wish, use a spatula or pat with palm on the top to make it smooth. 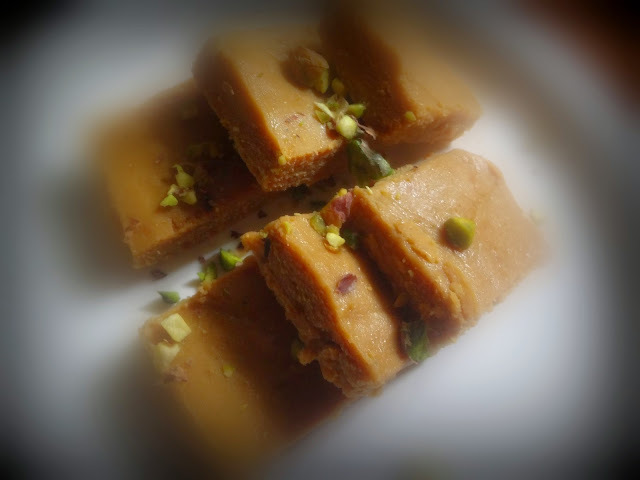 Now refrigerate for couple of hours minimum to get a perfect fudge.. You can shape these fudge into smaller pieces and wrap in candy papers to store in a box. Indulge your kids with these home made treats . These bits of fudge bites or choco bites (no coca added ) makes a great kid treat for parties. Shape them into balls and stick them on a thin stick , wrap with candy paper and your kids will lick a great treat lolly style. Add Sprinkles on top, chocolate ganache, chocolate shavings . You can mix cocoa powder to the milk powder, mixture before making the caramel fudge to get a yummy chocolate flavored fudge. The possibilities are infinite. I have just shared a basic recipe for you to work on...put on the creative thinking caps and start making fuss free easy fudge.